Chevron sought to improve its cargo materials tracking and inventory control procedures. 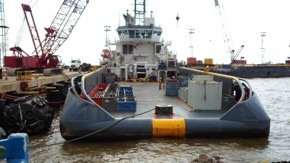 For the marine vessels which make deliveries to off-shore platforms, Chevron wanted real-time visibility of items loaded on the skiffs for greater deck space control. RFID Global analyzed business processes ranging from warehouse and pipe yard inventory management, to lift equipment and marine vessel logistics, to IT and security processes. The RFID Global team then recommended asset track and trace processes and sensor technologies to improve inventory management to reduce process time, prevent misplaced items and save costs. The solution was designed to provide real-time equipment status at inspection yards and a vessel manifest which would maximize deck space utilization and lower transportation costs. Real-time locating systems improve business operations planning and response times and maximize deck space control.